The purpose of this Information is to provide you with a quick reference for guidelines and policies for University Park Elementary School. In addition to this information, you will also be receiving weekly emails to keep you updated in regard to ongoing programs and activities. Our website is updated frequently with calendar changes and important information. Studies show that there is a direct correlation between good school attendance and student achievement. Therefore, we encourage you as parents to reinforce the importance of school attendance and to make every effort to send your child to school on a regular basis. Please call 949-936-6301 before 8:45 AM each day if your child will be absent or tardy. The above line is dedicated specifically for this purpose. All tardy students must sign in at the front office before going to class. Attendance and tardies are monitored at the District level and, per CA Ed Code, letters will be generated if your child has three or more tardies of 30 minutes or more, ten tardies of less than 30 minutes, or three unexcused absences. Per CA Ed Code, a student shall be excused from school when the absence is due to illness, medical/dental appointments, a funeral for immediate family members, observance of a holiday or ceremony of his or her religion, attendance at religious retreats, or student’s appearance in court. The majority of students who have accumulated more than three unexcused absences from school or tardies at University Park are not considered habitual/chronic truants but would be categorized as soft truants. Keeping an older child home to babysit. Taking a vacation during school. In order to keep all our students safe, it is important that we verify all student absences as soon as possible each day. Should your child need to be absent from school, please call our attendance line at 949-936-6301 to report the absence. This number may be called at any time. If possible, we ask that you call this number and report your child’s absence by 8:45 a.m. By doing this, we can avoid calling you at home or work to verify your child’s absence. As stated above, it is important that children be in attendance whenever possible. In addition to missing important classroom instruction, students are often challenged with feelings of trying to catch up. As important as punctuality and attendance are to student achievement, children should not be sent to school ill. Children who come to the office with a body temperature of 100 degrees or above will be sent home and should remain at home until a normal body temperature is maintained for 24 hours. Homework may be requested after the second day of absence. You may contact the teacher directly and check the classroom website for assignments. If you find it necessary to schedule a medical/dental appointment during the child’s class time, please have your child dismissed through the office. All volunteers must complete an IUSD Volunteer Registration & Screening Information form prior to volunteering. Information about volunteering can be found online at https://iusd.org/parents/parent-involvement/volunteers. All visitors will need to show photo identification when visiting our school. Child Development Center and programming offered via the City of Irvine are a positive alternative for working parents in need of childcare. CDC is located on campus in the buildings adjacent to the back of our school. The CDC’s hours are from 7:00 a.m. until 6:00 p.m. They can be reached by calling 949-653-0352. The City of Irvine offers after-school programs located at University Community Park. If you would like additional information, including fees, please call 949-724-6815. To receive information regarding other Irvine childcare facilities, you may call the Irvine Community Services Department at 949-724-6632 or 949-724-6635. Celebrations can be educational, fun, and exciting for our students. Dietary restrictions, cultural beliefs, food allergies, and the varied nutritional preferences of our parent population require considerable and deliberate coordination of any event involving food. Students in our school community have life-threatening allergies to certain foods and other allergens. With that in mind, classrooms are expected to follow the guidelines outlined below for celebrations and parties. We believe there is a correlation between a student’s behavior and his/her clothing. There are a wide range of available clothing styles that reflect a positive attitude and appearance. We ask that students attending University Park wear clothing that is comfortable, clean, and appropriate for an elementary school. Because our instructional program includes active play, students must wear clothing that allows them to run and jump. Clothing and other items students wear must not disrupt the educational process nor create any form of disturbance. All fashions that a student might choose may not be appropriate for an elementary school. Pants or shirts that are oversized and do not fit securely at the waist. With the support and cooperation of our parents, students, and staff, University Park will be a positive and productive learning environment. Children leaving campus need to be signed out by the parent/guardian. Please come to the office to do so and we will call your child. Children will only be released to parents or other adults listed by you on the child’s emergency card. If there are specific limitations related to the release of a child to a natural parent, please be advised that legal custody documents must be on file in the office. The natural mother or father can obtain their child from school at any time unless a court order is on file indicating otherwise. Photo I.D. is required to be shown when picking up students from the school. Field trips are an integral part of the elementary school experience. It is common for students in every grade at University Park to take a few field trips each year. In order for students to participate in a class field trip, a Field Trip Permission Form is required to be completed and signed by a parent/guardian prior to departure. Please contact your child’s teacher if you would like information about scholarships due to financial hardship. Parents are best able to assist their child by setting up a special place where homework is to be done. Specific times should be set up that does not conflict with other planned activities. This will provide structure to the homework routine. When your child visits the school’s health office, a note will be sent home notifying you of the visit and a brief description of the reason for the visit will be provided. If your child does not have a fever or the reason for their health office visit is minor and does not require action from a parent, they will be sent back to class. If your child becomes ill or experiences an accident at school that requires him/her to be sent home or seek medical attention, you will be contacted immediately. If we are unable to reach parent(s) or guardian(s) at home or work, we will then call the emergency contacts listed on your child’s record. Please keep home phone, work number(s), cellular phone number(s), pager number(s), and emergency contact names and phone numbers current in the Parent Portal. If someone cannot be reached that is listed on your child’s emergency card, depending on the seriousness of your child’s condition, paramedics may be called. This includes, but is not limited to a child having an asthma attack or allergic reaction and no inhaler, epi-pen, or medicine has been provided. 911 will be called in all life-threatening situations. The Irvine Unified School District offers a hot lunch program for students. University Park also offers snack options that cost between $.50 and $2.00.The cost of an elementary lunch is $3.25 per meal and milk alone is $.50. Each student has been assigned a personal identification number. Parents are asked to deposit funds in the student’s account either electronically or by sending a check to school with your student. The goal of the school and the school district is to be cashless. Money will not be handled in the lunchroom—please do not take your money to the cafeteria. Option 1- Go to www.MySchoolBucks.com and register for an account. Option 2- Send a check to the school office made payable to IUSD Nutrition Services. Include your student’s Lunch Pin number on the memo line of the check. To contact the general phone line for Nutrition Services call (949) 936-6520. To see when snack or recess is for your child, see our bell schedule. A parental release form is on file in the office. Both the physician and a parent must sign the consent form prior to medication being administered at school. The University Park PTA is a very active and supportive group. The association is composed of volunteer parents and committed staff members who devote their time and talents to providing support for our school and special experiences and events for our students. There are many opportunities for parents to become involved. Your membership and participation in this outstanding organization benefit your child’s education. Membership and other PTA related information are sent home during the first few weeks of school. Research shows that parent involvement is key to helping children succeed in school. The idea has been basic to PTA’s philosophy and action since its beginnings in 1897. PTA goes even further by stating that children do better in all ways when their parents care about what they are doing at home, in the community, and in school. PTA activities establish communication between school and home. 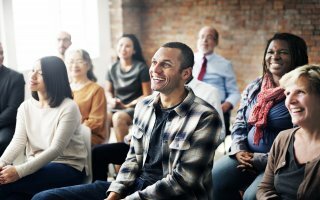 Parents are encouraged to attend meetings, support activities, and volunteer. Visit the PTA’s website to learn more https://www.universityparkpta.com/. University Park Elementary School welcomes and values our volunteer parents. Without volunteers, many programs and activities offered at our school would not be possible. Parents will be given opportunities to sign-up to help in the classroom, and to assist with various events taking place throughout the school year. All volunteers must complete IUSD Volunteer Registration & Screening prior to volunteering and show photo identification when visiting our school. Please check with your child’s teacher for more information. University Park’s Panther P.R.I.D.E. is a school-wide commitment to positive behavior support. Identifying, teaching, and reinforcing the expected behaviors allow students to achieve academic, behavioral, and social success. University Park’s Panther P.R.I.D.E. stems from the University of Oregon’s Center of Positive Behavior Interventions and Support (P.B.I.S.). 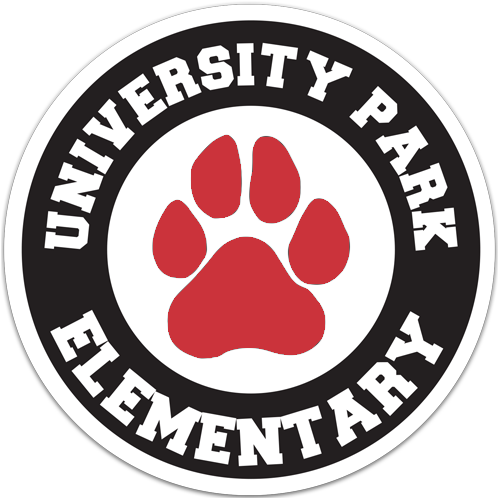 University Park Elementary staff has undergone extensive training and has experience with the P.B.I.S. philosophies. Punctual and Prepared - On time and ready for learning. Integrity- Conducts human interactions in a fair and straightforward manner; tells the truth; does not cheat, steal; behaves in a manner consistent with one's professed values and ideals. Dependable - Even when facing adversity and challenges. Demonstrates a willingness to act positively on a moral value even in the face of potential personal loss; a willingness to take calculated risks to achieve a positive result. Everyone’s Safe – Safety first. Holds him or herself accountable for making choices that are safe. We provide students with positive, immediate, and frequent reinforcement for these positive behaviors. When students are caught doing the right thing, University Park Staff rewards them with panther pawsitives. Other student acknowledgment opportunities will include panther pawsitives drawings in the classrooms, monthly recognition at assemblies, classroom award distribution, and monthly prize cart drawings. Utilizing the “Systematic Change Model”, attention is focused on creating and sustaining primary (school-wide), secondary (classroom), and tertiary (individual) systems of support that improve lifestyle results for all children. This makes problem behavior less effective and desired behavior more functional. It is research-based and it works! Clearly defined school-wide expected behaviors. Expected behaviors are intentionally taught in all school settings. Purposeful reinforcement for demonstrating positive school-wide expected behaviors. Consistent consequences and opportunities for re-teaching positive expected behaviors. Use of data to make decisions about school-wide practices. Comprehensive staff and student involvement. Improve academic culture through increased instructional time. Improve the behavioral culture through a decrease in office discipline referrals. Improve school safety and positive peer interactions. A student who is driven by values is concerned with society as a whole. A person who is driven by values understands why we have values, is willing to use values, and can identify and prioritize his or her own values for the good of the community. We teach these values through a school-wide behavior program based on PBIS. Instead of focusing students on a list of school rules that tell students what not to do, P.R.I.D.E. focuses and teaches students what to do and how to behave. In addition to the natural intrinsic rewards and consequences attained by students who exhibit positive behavior and follow P.R.I.D.E., University Park positively reinforces students individually and as groups through classroom and school-wide recognition programs fairly and consistently. Possible negative consequences earned by students for infractions of the University Park rules may include a verbal warning, loss of privileges, parent contact, parent conference, suspension from class, and suspension from school. Second offense: phone call home. Third offense: suspension from school. Causing serious injury to another. Possession of any knife or other dangerous objects or look-alikes. Causing or attempting to cause damage to school or private property. Possession of or use of tobacco. Committing an obscene act or habitual profanity. Disrupting school activities or willfully defying authority. Supervision by staff at entry points to our campus, in the parking lots, and on the playground is provided 10 minutes before school begins every day. For your child’s safety, students should not arrive on campus prior to 7:45 a.m. Upon arriving, all students in grades first through sixth report to the playground blacktop and line up for class in their assigned area. 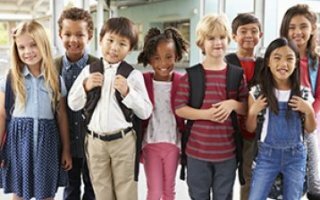 Transitional Kindergarten and Kindergarten students must be accompanied by an adult and line up outside their classroom in their assigned area, and they are dismissed directly to their parent or guardian at dismissal. Students in grades first through sixth are dismissed from the outside door of the classroom to meet their parents, carpool, daycare provider, or walk home. After school supervision ends fifteen minutes after dismissal every day. All students should leave campus within fifteen minutes after school unless other arrangements have been made or they are being directly supervised by a parent. No student will be kept after school without prior parental permission. Recess and lunch supervision is provided by trained University Park staff. Playground supervisors are easily identified by bright colored vests and their IUSD identification badge. Report cards are issued at the end of each trimester during the school year. During the first month of school, parents are invited to attend Back to School Night to learn about the grade level curriculum and instructional program for their child. This evening is for adults only. A goal setting parent/teacher conference is held at the beginning of October to establish learning goals for each student. A second parent/teacher conference is scheduled in the spring for some students. 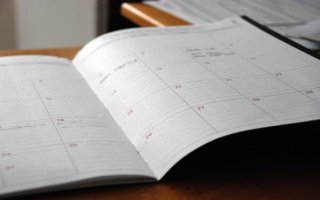 Parents are encouraged to schedule conferences with the teacher anytime they feel there is a need during the school year. IUSD Board Policy only allows elementary children in grades third through sixth to ride their bicycles to school. Each bicycle must be in safe working order and be equipped with a lock and be parked in the bike racks. Bikes should be locked at all times when not in use. California law requires that all school-age bike riders wear safety helmets. Additionally, University Park students in grades third through sixth may ride skateboards or scooters to school if they are wearing a helmet and have the ability to lock it in the bike racks or have made arrangements with their teacher to keep it in the classroom while school is in session. Students in grades kindergarten through second may ride skateboards or scooters to school if they are wearing a helmet, are accompanied by an adult, and the adult takes home the scooter or skateboard. Children and adults are expected to follow all traffic safety laws when going to and from school. In the interest of safety and taking into consideration the number of people around the school at arrival and dismissal times, students must walk their bicycle and carry their skateboards or scooter when they are on school grounds. If your child will be walking, riding a bicycle, skateboard or a scooter to school, please discuss the safest route with your child. Bicyclists and pedestrians must use crosswalks and utilize the assistance of a crossing guard or staff member when provided. To see The City of Irvine Suggested Route to School map for our school, click here. We want to reassure you that University Park Elementary has an extensive emergency plan. 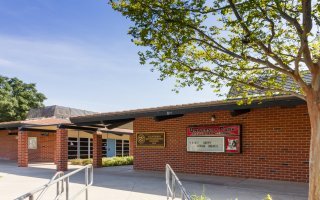 In compliance with California law, the Irvine Unified School District uses the Standardized Emergency Management System (SEMS) in its emergency plans and procedures. Response procedures are in place to activate the emergency plan. Each year the staff reviews and practices the plan in mock drills to ensure the safest and most efficient response to an emergency. State law requires each elementary school to conduct monthly fire drills, a lock-down drill, and a drop-and-cover drill as part of the emergency preparedness plan. Volunteer in your child’s class. Make sure to sign in and out and wear a visitor/volunteer sticker at all times. The school district makes available to parents a low-cost accident and health insurance for their children. Forms are available through our re-registration process. Additional forms are available in the office. The desirability of having such a plan can provide benefits and coverage when help is needed. “Educational activities” has been clearly defined to include extracurricular offerings such as music, sports, and some clubs. Moreover, the rules described above are believed to apply to all affiliated groups supporting district and school programs, including PTAs, boosters, and foundations. In 2010, the American Civil Liberties Union filed a lawsuit against the state over impermissible fees, charges, and deposits imposed on public school students. Two years later, Governor Jerry Brown signed legislation that codified existing laws and judicial decisions while establishing reasonable enforcement measures for schools and districts. The ACLU subsequently dropped its suit. It should be noted that IUSD was in the process of analyzing its own practices even before the ACLU suit, looking specifically at funding requests that were made to help offset the cost of transportation, elective courses, summer school classes, and essential supplies and equipment. The district has since worked to clarify that parent donations for most educational activities are voluntary and that students will not be denied participation if their families choose not to contribute. Textbooks and library books are school property and are loaned to students. Students are responsible for their safekeeping. All hardcover textbooks must be covered. Students are responsible to pay for lost or damaged textbooks. Most textbooks are available online. The Irvine Police Department actively patrols the area around University Park at arrival and dismissal times. They watch for cars speeding, illegally parking, and other unsafe driving behaviors. In order to keep our students safe, we ask that parents use caution when driving in our parking lot and around our school. When parking in the neighborhood, please obey all traffic laws and be considerate to our neighbors. Please do not block driveways, leave trash in the area, allow your children to play on someone’s yard, or make excessive noise. At no time may a driver leave his/her car unattended or park in the loading zone. In addition, the Irvine Police Department will cite any parent unloading students in any street away from the curb, often referred to as double parking. Not only is it illegal, but incredibly dangerous. Cell phones are permitted at school, however, board policy requires that they are deactivated during the regular school day and used only during an emergency affecting the school or community. The use of cell phones is prohibited during school hours. They are to be turned off and in the student’s backpack during school hours. Cell phones that are turned on during school hours are subject to confiscation and will only be returned to a parent through the front office. We ask that you take care of all arrangements for the day with your children before they leave for school. If the forecast is for rain, send them in a coat or jacket and give them a plan for pick up/dismissal for inclement weather. If after-school activities are scheduled, be certain that they know what is expected of them before they leave for school. We ask that only emergency messages be telephoned in to children since we strive to keep instructional interruptions to a minimum. Arrangements with friends must be made prior to coming to school.